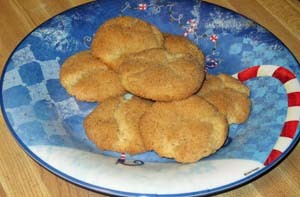 It’s not necessarily odd that I’d never made snickerdoodles before tonight. What is odd, though, is that I’d never had one until a couple of years ago, when someone brought some into work for a potluck. It was love at first bite. How could I have missed out on all this crunchy, chewy, cinnamony goodness for all this time? I remembered that goodness today as I racked my brains for Christmas cookie to complete the collection. Chocolate? Check. Fruit? Check? Sugar cookies? Got it, plus the food coloring stains on my hands to prove it. What to do next? Ah, snickerdoodles! The recipe at allrecipes.com was a snap to convert. I simply used egg replacer and added milk. I opted for Bob’s Red Mill Egg Replacer, because I knew the cinnamon would mask the slightly soy taste it can leave when you’re using it to replace more than one egg. 4 tbl. Bob’s Red Mill Egg Replacer mixed in 4 tbl. warm water and cooled. The mixture is very thick. 2 tsp. ground cinnamon – that might be what the recipe says, but that’s a mere suggestion for me. I used a lot more, but I’m not sure how much. I just dumped. Preheat oven to 400. Cream butter, shortening, 1 1/2 cups sugar, the egg replacer, milk and vanilla. Blend in the flour, cream of tartar, soda and salt. Shape dough by rounded spoonfuls into balls. Mix the 2 tablespoons sugar and the cinnamon. Roll dough in mixture. Place 2 inches apart on ungreased baking sheets. Bake 8 to 10 minutes, or until set but not too hard. It took mine 11 minutes on AirBake. Remove immediately from baking sheets.